SGCC’s latest consumer-pulse study finds high levels of interest in grid edge tech, but also hesitancy. Electricity customers have more choice in how they consume and manage their energy today than at any time before, and the number of options available continues to multiply. But what is it customers want? What types of products and services are they being drawn to? And are they following through with a purchase? That’s what the Smart Grid Consumer Collaborative’s (SGCC) latest Consumer Pulse and Market Segmentation Study seeks to shed light on. It examines how customers interact with electricity providers and utility programs, and how they view a broad suite of “smart grid” technologies and programs. The 2017 survey released last month obtained responses submitted online from 1,652 individuals sampled from each of the nine U.S. census divisions. The respondents were categorized in three broad groups: always engaged, rarely engaged and selectively engaged. Within those segments, the report identified five sub-groups: Green Champions, Movers and Shakers, Technology Cautious, Savings Seekers and Status Quo. 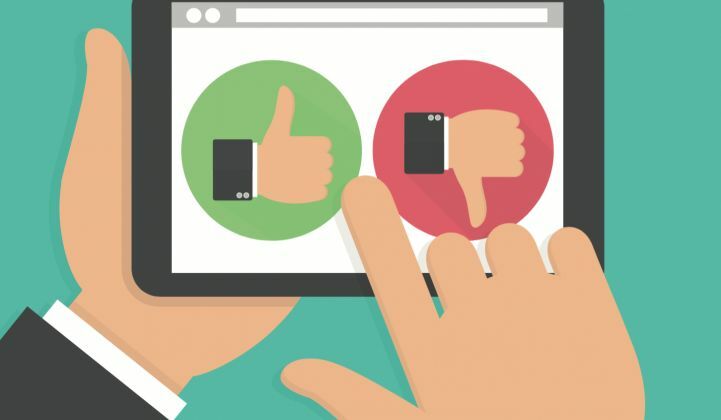 The results show that, overall, consumers are aware of what the smart grid is and are interested in all types of smart-grid-enabled programs and technologies. In this year’s “Wave 6” survey, more than two-thirds of respondents said they’ve heard of the smart grid and smart meters -- up significantly from the Wave 5 study. Consumers of all types associated the smart grid with saving money, fewer power outages and clean energy resources. “The term ‘smart grid’ has made entry into consumers’ awareness like 'smartphones' and 'the smart home,' and people generally feel positively toward the word,” said Patty Durand, president and CEO of SGCC. Large percentages of consumers expressed interest in smart grid offerings, with energy storage emerging as the most attractive. Almost three-quarters of all respondents said they're interested in an energy storage system that could provide backup power for their home. In addition, more than half of consumers are interested in rooftop or shared solar and programmable thermostats -- 58 percent and 56 percent, respectively. But while interest is high, actual participation rates are low. Across all segments, one in five consumers report having already participated in at least one utility program, and 13 percent have used at least one smart-grid-enabled product. The most common programs and products are online billing and payment (40 percent), energy use comparison tools (9 percent), and smart thermostats (9 percent). Part of the problem is that smart-grid-enabled technologies can be complex and may require significant upfront investment. “This presents an opportunity for industry stakeholders to educate consumers by assuming the role of ‘trusted adviser’ and by providing incentives that help boost adoption,” the report states. Cost is a predominant factor. While most customers see benefits to smart grid products and services, their willingness to pay for them varies. Respondents in the “Green Champions” segment -- described as technologically advanced, college-educated and higher-income -- were the most likely to pay for smart grid technologies, but they weren’t keen to pay much. Among Green Champions, 40 percent said they would pay just an additional $3 to $4 per month. More than half of respondents in all other groups were hesitant to pay more for smart grid benefits. Among “Status Quo” consumers -- characterized as retired, lower-income and living in rural areas -- the responses were somewhat varied, however. 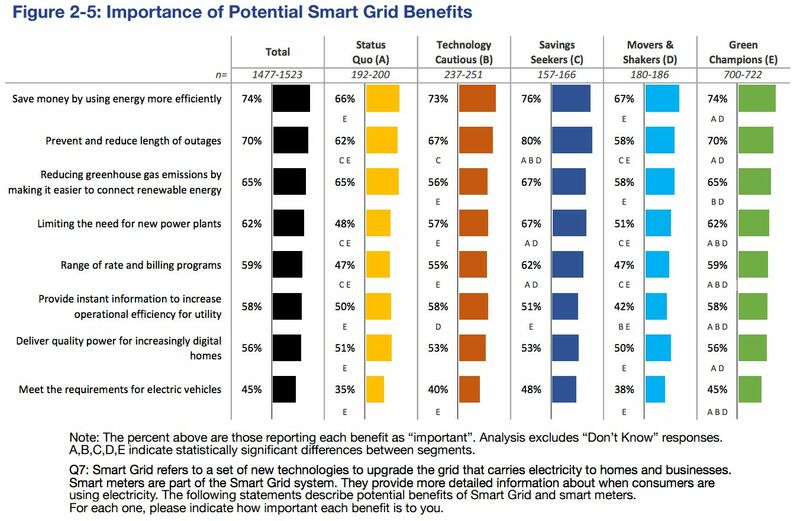 A majority were unwilling to pay a premium for smart grid benefits, but 17 percent of respondents in this group were willing to pay an additional $3-$4 per month. 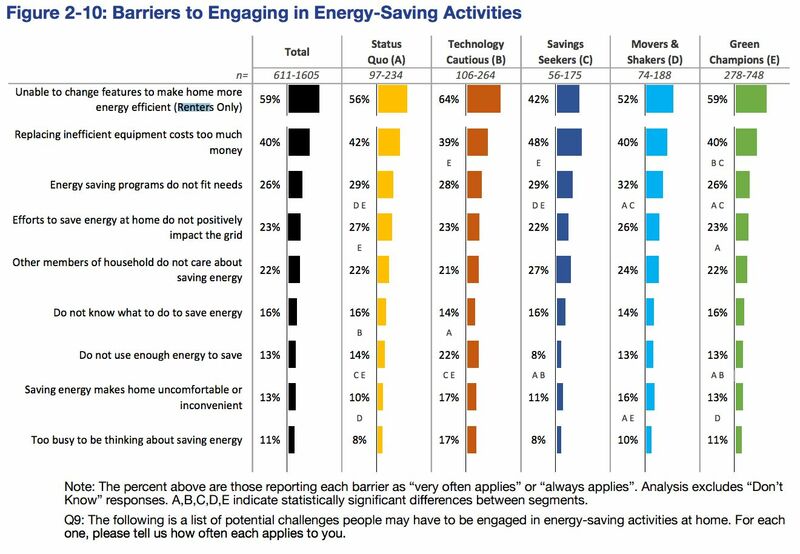 Meanwhile, 6 percent of Status Quo consumers said that smart grid benefits simply aren’t important. 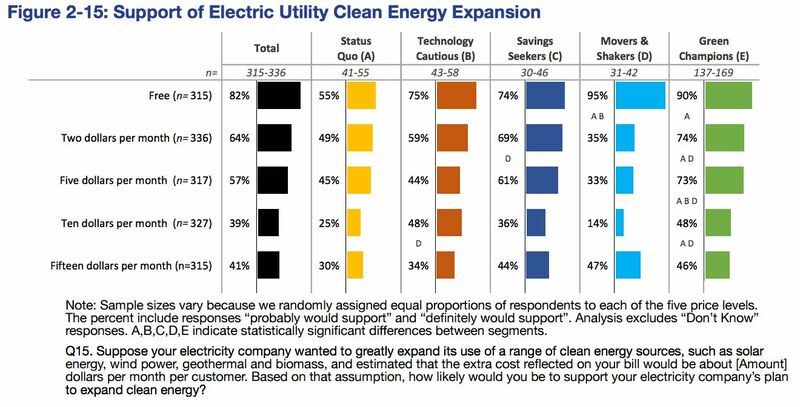 Interestingly, most consumers support the expansion of their utility’s clean energy programs, and many are even willing to pay a small premium for it. A substantial amount (41 percent) said they would pay $15 per month to expand their utility’s clean energy programs. Millennials represent one of the biggest opportunities for electricity-sector stakeholders. They identify as Green Champions, but they are more likely to report barriers to adopting smart grid technologies. The survey shows that cost, and the fact that many millennial respondents are renters, is part of the problem. Join us at Grid Edge World Forum June 27-29 in the heart of Silicon Valley. We'll have three days of sessions that address virtually all facets of the grid edge. We'll have the most influential executives, entrepreneurs and analysts from across the energy sector to meet during unparalleled networking opportunities and exhibition. Come join the audience of global utilities, emerging startups and fast-growing industries like EVs and customer energy management. Learn more here.